Say goodbye to plug-in lamp modules and get a clean, professional look with the new OutletLinc Dimmer. This revolutionary receptacle is the first of its kind to offer a built-in dimmer that can be remotely controlled from anywhere using devices such as a remote control, wall keypad or even your smartphone. The simple-to-use OutletLinc Dimmer has advanced features like an adjustable ramp rate that slowly brings the lamp on, a preset dim level that stores your preferred choice of 32 brightness levels when turning the lamp on initially, as well as load sense, so you can still use the lamp's built-in switch to turn the light on and off. It's made to be installed in place of any wall receptacle and controls incandescent loads up to 300 Watts. Also features a standard (always on) outlet rated up to 15 Amps. Spring-loaded shutter mechanism allows plugs to enter but resists access to single-pronged items like keys, hairpins, or nails. Conforms to NEC Article 406.11. If ever the internal temperature of the receptacle rises to unsafe levels, OutletLinc Dimmer will automatically shut off power. In order for the top outlet dimmer to work, the lamp plug must have the Dimmer Key attached. This key is a small, razor-thin piece that goes over the lamp plug. 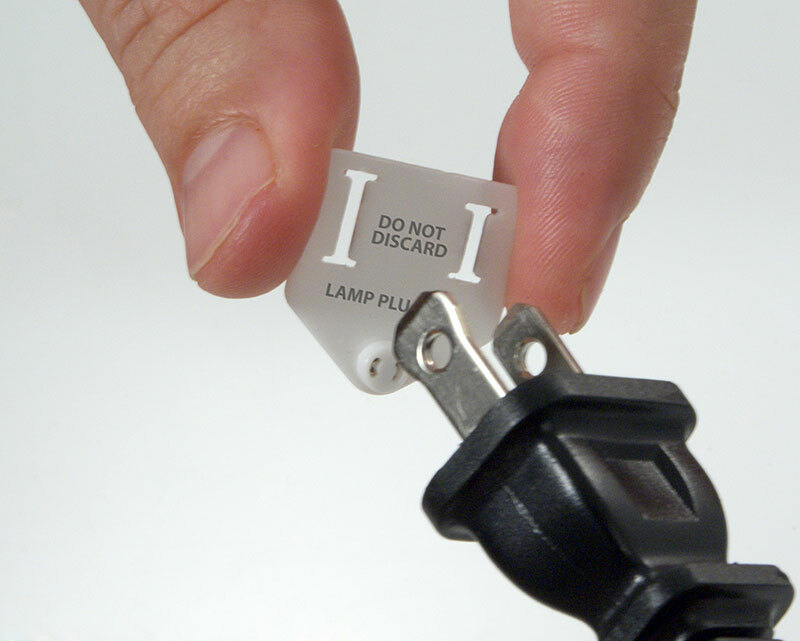 This prevents others in your home from unplugging the lamp and plugging in non-dimmable appliances that could result in damaging of the appliance. This latest member of the INSTEON family of products features dual-band technology which allows OutletLinc Dimmer to send and receive commands using both radio frequency (RF) and power line. So not only can you control it from power line-only or RF-only devices, it will repeat both signal types for other devices in your network, making your entire INSTEON system faster. A dual-band device can also act as a phase bridge when paired with another dual-band device in the home. For added convenience, the OutletLinc Dimmer bottom outlet is always on. So, whether you need an outlet in the hallway for the vacuum, or an outlet behind the living room couch for an INSTEON tabletop controller, you'll never have to worry about the outlet being switched off. Also, if you ever need to switch the top outlet on manually, you can either use OutletLinc's built-in ON/OFF button (located between its two outlets) or turn your lamp or appliance on and off with its own ON/OFF switch (with load sensing enabled). INSTEON OutletLinc Dimmer is fully INSTEON compatible and X10 ready. Homeowners with existing X10 networks can easily migrate to an INSTEON network without having to discard all their existing X10 devices. X10 ready means that the module can respond to X10 commands from an X10 controller. Please note that INSTEON devices repeat INSTEON signals but not X10. All settings are stored in non-volatile memory and are not lost during power failures. All OutletLinc products are safety approved. The factory for SmartLabs Design Products is ISO9001 certified. Because of this passion for quality, Smarthome stands behind the entire line of products with a full 2-year warranty. Thermal Overlaod Protection Disabled controlled outlet until condition resolved and operated with ON command or front button push.